There are a few things I do enjoy about summer. As much as I grouse and complain about the heat and humidity (and it has been a particularly hot and humid summer this year), I do enjoy some of the side effects - especially the edible ones. Actually, it's only the edible side-effects that I like about summer. Thanks to all that heat, the corn and tomatoes are beautiful right now. 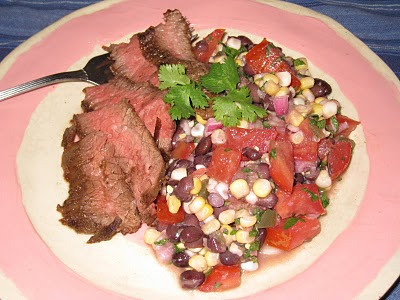 And nothing goes better with corn and tomatoes than black beans, lime and cilantro. Corn and Black Bean salad embodies what is good about summer - fresh, cool and full of flavor. And it's the perfect foil for my other summer favorite - skirt steak. I didn't think far enough ahead when I decided to make this to grab a fresh serrano pepper while I was at the grocery store, which I regret. Luckily, I always have pickled jalapenos on hand, so that worked out. While pickled always has its place, fresh is best in this case. Combine the black beans, corn, onion, tomatoes, jalapeno, garlic, cumin, salt and pepper in a large bowl and stir gently to combine. Add the cilantro, lime juice and olive oil and fold into the vegetables, being careful not to mash the beans. Taste and adjust salt and pepper if necessary. Can be served immediately, or refrigerated if being used later. If refrigerated, bring to room temperature before serving.